Fearsome Magics is the second New Solaris Book of Fantasy, following Fearsome Journeys. It’s a significantly more varied volume, themed around magic in stories, and Strahan has brought stories from a variety of different milieus to bear on the theme. Fearsome Magics is a much broader anthology but also a rather less diverse one; eight of the fourteen authors are women, although every author is white. That doesn’t mean there isn’t a wide variety of settings here; Strahan has selected stories that invoke the American heartland, secondary worlds, and past times of stage magic. This is an anthology whose scope includes the magic-permeated setting of K J Parker’s ‘Safe House’, a brilliantly told story whose twist is obvious in retrospect and neatly set up, albeit perhaps with a little too much pleasure taken in the glib voice of its narrator; and Ellen Klages’ magicless setting (stage magic aside) in ‘Hey, Presto!’, a beautiful family tale of a father and daughter building a relationship around dedication and effort. The scope of those two really sums up the breadth of the anthology; from the epic creation of a secondary world with history, politics, cultural differences and more, to the telling of a tale in what is very reminiscent of late-Victorian England; from a male agent sent on a covert mission because of his magical prowess to a studious young girl reconnecting with her father; from a story that is glib, funny and wry to a story that is heartfelt and beautiful. Perhaps the best story in the collection is the least concerned with magic; Isobelle Carmody’s ‘Grigori’s Solution’ is a very quiet apocalypse story, in which a mathematical formula has brought about the end of the universe. Told from the first-person perspective of a journalist, the story is reminiscent of Kurt Vonnegut’s Cat’s Cradle in the chaos caused by the end of the world and the interest in the consequences of that, but whereas Vonnegut is also interested in what leads up to that, Carmody is more interested in the quiet individual stories, the personal responses to the end of the world; she takes the reader through the five stages of grief for the world as it slowly vanishes into the blackness, without ever really being interested in how it has happened or what caused it. The use of a single viewpoint telling the stories of many different people works brilliantly, and the conceit of a reporter writing an article that will never be read is extremely well carried off. The other stand-out stories are about death, in various ways; ‘Aberration’ is Genevieve Valentine’s take on immortality and time-travel, and a painful look at what being rootless and witnessing vast amounts of death would mean. It’s a strange, weird story partially told in second-person glimpses; and is about roots, and homes, and the importance of a full stop at the end of a sentence. ‘Ice in the Bedroom’, on the other hand, is a very personal look at the other side; the griever left behind by the deceased, and the process of grief. Making concrete the process of grieving is an interesting technique, and Shearman’s blurring of the lines between dream and reality is incredibly well done and profoundly moving. Unfortunately, most of the stories aren’t up to that standard. Tony Ballantyne’s ‘Dream London Hospital’, for instance, is a messy story, without clear framework or plot; while perhaps making more sense in the context of his novel Dream London, shorn of that Ballantyne has written a sort of strange, impossible half-world of dreams and, like listening to the dreams of others people, reading about them tends not to make much sense; this story certainly doesn’t buck that trend. In a differently messy way, Kaaron Warren’s ‘The Nursery Corner’ is a story that really only needs a few pages to be told, but is instead drawn out in an attempt to add extra depth and pathos in an entirely unsuccessful way; it takes what would be a creepy horror concept and renders it overdone. Christopher Rowe’s ‘The Dun Letter’, meanwhile, opens the collection on a fairytale-changeling story; unfortunately, it’s one that can’t decide what it wants to be, quite, between a story of a girl abandoned and looking after her grandmother and a mockery of typical portal fantasy, and ends up somewhere in between, being neither and achieving very little. 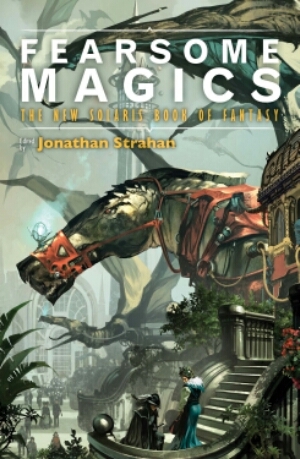 After the incredibly high standards of Fearsome Journeys, I expected Fearsome Magics to continue the strong showing; unfortunately, Strahan’s second foray into the New Solaris Books of Fantasy simply doesn’t live up to the standards set by the first, despite some outstanding stories. By Intellectus_Speculativus in Review on April 17, 2015 .